Sami Ibrahim Isa Abdel Hadi, 39, was stopped for tailgating on Route 46 in Ridgefield Park, New Jersey. When a Bergen County police officer called in Abdel Hadi's North Carolina license plates, he learned that Abdel Hadi had been ordered deported to Brazil in December 2001 and is listed in the FBI's National Crime Information Center database. Even more interestingly, Abdel Hadi has a valid temporary I.D. from L & L Painting to paint the George Washington Bridge (a high-profile potential terrorist target). 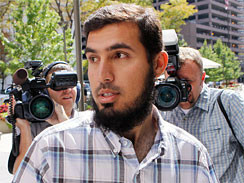 Abdel Hadi is hardly the first actual or potential terrorist stopped due to a routine traffic infringement. In July 2004, Michael Wagner's not wearing a seat belt got him stopped in a SUV near Council Bluffs, Iowa, that had in it "flight training manuals and a simulator, documents in Arabic, bulletproof vests and night-vision goggles, a night-vision scope for a rifle, a telescope, a 9mm semiautomatic pistol and hundreds of rounds of ammunition." Timothy McVeigh was stopped in April 1995 as he sped away from Oklahoma City bombing that killed 168 people and injured more than 500 because his car lacked a license plate. A New Jersey state trooper noticed Yu Kikumura's odd behavior at a New Jersey Turnpike rest stop in April 1988 and thoroughly searched his vehicle, finding three powerful homemade bombs. Kikumura, a member of the Japanese Red Army, was sentenced to thirty years in jail followed by deportation to Japan. Three members of the Syrian Social Nationalist Party (Walid Nicolas Kabbani, Georges Fouad Nicolas Younan, and Walid Majib Mourad) were stopped by Richford, Vermont's only policeman in October 1987, because he was suspicious of their movements. Indeed, they were smuggling a bomb from Canada to the United States. cops investigating minor auto accidents or traffic infractions allegedly asked mosque members inappropriate questions about their citizenship status. "The typical question has been: 'Where are you from, where were you born?' ... Two questions that are totally irrelevant at an accident scene." In one of the incidents near the Staten Island Mall at Christmastime last year, a female Pakistani wearing a Muslim shawl repeatedly was asked where she came from, he said. "This is an educated woman," [the Muslim leader] said. "When a policeman first asked her where she was from, she told him Staten Island. Then he asked her where she was born. She told him Pakistan." There were other incidents in the spring, he said, including the case of a girl caught crossing against a traffic light in New Springville being questioned. For his part, Girimonte agreed that the interrogation was improper: "Asking a person at an accident scene where they're from is not necessary. Once your proper ID is confirmed, all you want to find out is what happened." He acknowledged being "surprised" by the incidents and promised that traffic stops would not lead to questions about citizenship status. "This is basically a training issue. And we'll address it. The police should not be concerned with the citizenship status of motorists. That's not our bailiwick." 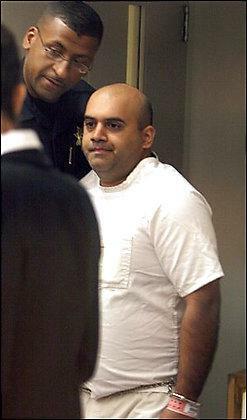 Tragic proof that Albert Girimonte is wrong and I am right came yesterday, when Naveed Afzal Haq was driving to the Jewish Federation of Greater Seattle building, where he proceeded to murder one person and severely injure five others. According to Seattle Police Chief Gil Kerlikowske, as paraphrased by the Associated Press, Haq had been "stopped shortly before the shootings in Seattle for a minor traffic infraction, and was cited and released. ... Haq had a valid driver's license and his actions did not raise any suspicion." That traffic violation was driving down a buses-only lane. Comment: How many more murders will it take for the police to wake up to the danger of Sudden Jihad Syndrome? (July 30, 2006) Apr. 16, 2008 update: Police Officer Glen Cook gave testimony in Haq's trial, providing more details: Haq drove his white Mazda pickup north on Third Avenue at 3:37 p.m., a bus lane at that time of day, Cook pulled him over, took down Haq's license and proof of insurance, ticketed him, and let him go. July 1, 2007 update: The July/August issue of the magazine Crime & Justice International features an article on pp. 4-12 by Dean C. Alexander and Terry Mors, "Best Practices in Identifying Terrorists During Traffic Stops and On Calls for Service." It discusses "how patrol officers can assist in identifying and capturing domestic and international terrorists while undertaking traditional duties, with particular emphasis on traffic stops and calls for service." The author's advice is summed up in a few words: "Police should go on the offensive and aggressively look for signs of terrorist activity or involvement." Four men (Pratheepan Thambu, 22, Lojanand Srianandan, 27, both of Toronto, Sethukavalar Saravanabavan, 35, and Kirubakaran Selvanayagam Pillai, 38, both of London, U.K.) were riding in a rented van in Scarborough, Ont., on Jan. 28, when Constables Scott Aikman and Patrick Pelo watched them run a stop sign and pulled the van over. On looking inside, the officers noticed one of the four desperately hiding something. They also observed that the driver had been drinking, plus the presence of open liquor in the vehicle, giving them the right to search the vehicle, which they did. They found a number of plastic gift cards worth an estimated $250,000, with debit card information on the magnetic strip which police believe was stolen from UK bank customers. Police later searched a hotel and a home and found another 88 cards, all with debit card data from British banks on their magnetic strips, as well as $25,000 in Canadian $20 bills, laptop computers and memory sticks, receipts for money transfers to the U.K., travel documents and passports and what detectives described as "Tamil Tiger paraphernalia." When the officer approached the car, Loughner's hand was already thrust through the window, holding his license and registration. Forney said Loughner took off the black bandanna he was wearing. The officer saw that Loughner had a shaved head, something he thought was peculiar. He asked Loughner whether he knew why he had been stopped. He replied, yes, he did. During the traffic stop, another Game and Fish officer drove by, asking whether Forney needed any help. "I gave her the thumbs up at that point," Forney told investigators. "I had no reason to believe anything suspicious was going on." Forney said he didn't notice anything unusual inside the car, but had checked to make sure "the trunk was secure" on Loughner's '69 Chevrolet Nova. "I made the decision not to write a citation. Game and Fish doesn't write a lot of traffic citations ... I was also in kind of a hurry" to join [a meeting with] other officers for their patrol at Florence Junction, east of the Phoenix metro area. "I told him, 'I'm not going to write you a citation for this.' When I said that to him, his face got kind of screwed up and he started to cry.... That struck me as a little odd," Forney told investigators. "I asked him if he was OK. He said, 'Yeah, I'm OK. I've had a rough time and I really thought I was going to get a ticket and I'm really glad that you're not ... going to give me a ticket." Forney again asked Loughner whether he was OK, worried he would be driving with his emotions out of control, possibly leading to an accident. Loughner then immediately composed himself, he said. "He actually looked up at me and said, 'Can I thank you?' I said, 'Yeah, you can thank me.' He asked what my name was, and he stuck out his right hand."